IMPACT Newsrack - Bellatrix Systems, Inc.
- Customizable vinyl exterior ‘wraps’ that could carry the newspaper’s brand or display advertising messages. 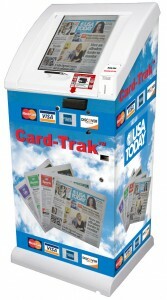 - Displays the newspaper at reading level on top of the rack to draw in customers. - Attractive box, which increases options for product placement. - Variations and models that distributed both tabloid and broadsheet publications. - Handled all domestic and most foreign coinage. - Card-TrakTM ready for credit card sales. This product has been discontinued, limited spare parts are available.